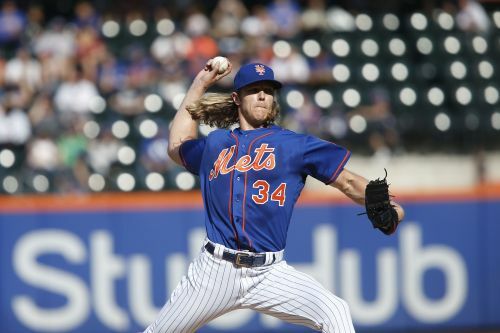 NEW YORK (AP) — Noah Syndergaard and the New York Mets ended this disappointing season the same way they want to start the next one. Syndergaard threw his first major league shutout and the Mets wrapped up a frustrating 2018 campaign Sunday with their second consecutive 1-0 victory over the Miami Marlins. "I told the bullpen before the game that they could take the day off. True story," Syndergaard said. "It's a great feeling." Todd Frazier hit an RBI double for the Mets, who finished fourth in the NL East at 77-85 under rookie manager Mickey Callaway — a seven-win improvement over last year. After beginning the season with playoff aspirations, they jumped out to an 11-1 start before going 5-21 in June as injuries once again took a heavy toll. New York rebounded a bit to win 33 of its last 55 games, but by then it was way too late. "I feel like we played some really good baseball," Syndergaard said. Promising rookie Sandy Alcantara (2-3) struck out a career-high 10 over seven innings in his sixth major league start for the Marlins — three against the Mets. "I thought he was more aggressive," manager Don Mattingly said. "There's nothing monumental that happened today other than this guy has a chance to be a really good pitcher, and consistency is going to be the key." After trading Giancarlo Stanton, Christian Yelich, Marcell Ozuna and Dee Gordon during an offseason payroll purge, the Marlins ended up with the worst record in the National League at 63-98 in Derek Jeter's first year as chief executive officer. Miami went scoreless over the final 24 innings. "Last two days, kind of indicative. We go (22) innings and only give up two runs and we don't win either game," Mattingly said. Jeter signaled this month that Mattingly is expected back next year. Looking to have some fun at the finish line, he appointed All-Star catcher J.T. Realmuto to pilot the team Sunday. "It was fun. I enjoyed it, for sure," Realmuto said. "It was actually a fairly easy game to manage because Sandy did a great job, obviously, so there weren't many moves on our part." Syndergaard (13-4) allowed five hits and fanned six in a fast finale that took just 2 hours, 10 minutes. He walked none and threw 101 pitches for his second career complete game. The other one came on Sept. 2 in San Francisco, and the big right-hander completed the season by tossing a career-best 15 straight scoreless innings while pitching with a sinus infection. "He kind of pitched at 90 percent, 95 percent. It's pretty good when you throw 95 (mph) at 95 percent," Callaway said. "But I think he learned a little bit of a lesson that sometimes a tad less is more." Alcantara struck out five straight before Jeff McNeil opened the fourth with a single for New York's first hit. McNeil scored from first when left fielder Isaac Galloway misplayed Frazier's hard-hit double. A day after David Wright's emotional goodbye at Citi Field, the Mets gave Jose Reyes another ceremonial start at shortstop. The 35-year-old Reyes, who batted .189 in a bench role this season, was lifted after grounding out leading off the bottom of the first. He hugged teammates in the dugout and received a warm ovation while coming out for a curtain call for the crowd of 28,346. "I just thought he deserved to be on the field one more time," Callaway said. Reyes, a four-time All-Star, doesn't expect to be back with the Mets next season and isn't sure about his major league future. Wright didn't play but was given a few more ovations. Syndergaard's bat broke off just above his hands as he started to swing — and obviously miss — at a third-inning pitch. "Maybe termites or something," the pitcher said with a smile. Teammates cracked up in the dugout as Syndergaard stood dumbfounded in the batter's box. "It was like the most Thor thing I can think of," outfielder Michael Conforto said. After getting some new lumber, Syndergaard struck out but then lashed a sharp single in the fifth. McNeil had two hits to give him 36 in September, breaking the club record for rookies set by Gregg Jefferies in 1989. Syndergaard's complete-game shutout was only the 19th in the majors this year, fewest in a season since 1874, when there were just eight teams. There were 27 such outings last season. The previous Mets pitcher with a complete-game shutout was Jacob deGrom on July 17, 2016. Syndergaard won his seventh straight decision at home and improved to 6-0 with a 1.64 ERA and 60 strikeouts against six walks in eight career starts against the Marlins. Mets: LF Yoenis Cespedes is scheduled for his second heel surgery Oct. 23 — this time on his left foot — but said he can't yet predict how much he'll be able to play next season. The oft-injured slugger had surgery Aug. 2 to remove bone calcification in his right heel, the first of two operations expected to sideline him for eight to 10 months. Marlins: Pitchers and catchers report to spring training Feb. 13, and Miami opens the 2019 season March 28 against Colorado. Mets: Begin next season at NL East rival Washington.